If you’re in the planning stages of building a fireplace or making over an existing one, you may feel overwhelmed choosing the right materials. On top of deciding what style suits you and your family best, cost, labor and maintenance make it even more confusing. To help, we’ve broken down the long list of stone fireplace ideas to help you choose the right stone for your home. How would you describe the fireplace look you want? Sleek? Modern? Rustic? Natural? Edgy? Warm? Cool? Elegant? Cozy? What’s your budget? Different materials vary greatly in price. Consider what you’d like to spend so you have a better idea of your options. How will the work be completed? Some fireplace stones are easier to install than others. And, of course, the more difficult the installation, the higher the cost. How much maintenance are you willing to do? After completing the installation, you’ll still need to consider whether to seal the stone, how difficult it will be to clean later, or if it stains easily. How durable do you need the fireplace to be? Some fireplace materials crack or break more easily than others, and you want to make sure the fireplace material you choose stands the test of time. Consider kids and pets when making this decision. If you want an elegant and formal style in your space, limestone offers the perfect choice. Keep it clean and simple, or ornate with intricate carvings. Limestone conveys calmness and serenity. Mystique and romance. A very soft, sensuous, and elegant natural stone. If you’d prefer a more rustic style, choose stacked limestone. The limestone should always be sealed. 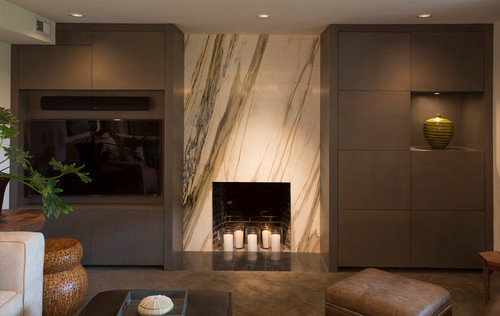 Place marble on top of fireplace masonry for a bright, sleek look. It is an elegant natural stone rich with beauty. A truly unique look and feel. Images of extravagance and wealth come to mind. It’s been used for centuries in palaces, temples, and for sculptures. It can be formal or casual. The surface of the stone can be polished or honed for a more formal look. Marble should always be sealed and is fairly easy to clean. If your style varies more “rustic cottage,” slate might be the perfect option for you. Incorporate it with a stacked stone look, or apply it as slate tile for clean lines. Slate does require regular cleaning and occasional deep cleaning. It stands as one of the most durable materials aside from granite. Choose granite for a clean, contemporary look. It’s one of the most durable stones, and very easy to keep clean. Granite is one of the oldest, hardest, and strongest stones available. A truly beautiful natural stone with hundreds of colors and patterns to choose from. It symbolizes strength and longevity. A sleek rich feel. The finished products resulting from using granite are versatile, ranging from an unassuming elegance to a bold “look at me” statement. Granite is just as suitable for application in a farmhouse as well as in contemporary home. It’s all about the color and texture you choose. 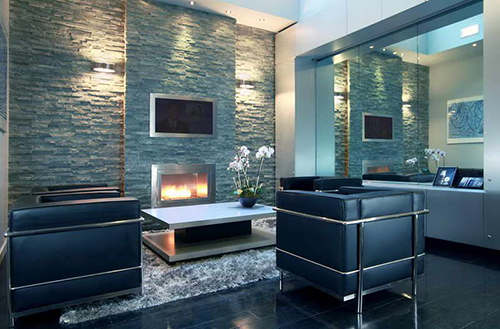 The advances in modern granite fabrication have also rendered granite to be an affordable luxury. Granite requires sealing, but should stand up to almost anything. A very versatile stone, travertine can be installed as stacked bricks for a rustic look, laid as tile for a modern look or carved for an Old-World look. The stone is soft and delicate to look at. It breathes spaciousness. It’s relaxed and soothing. The feeling is peaceful, tranquil, and serene. It’s a simple beauty. A casual formlessness. 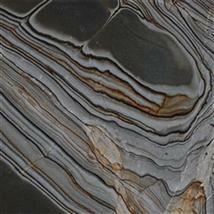 Travertine wears very similar to limestone and marble as far as composition. This stone has quite a palette of unique colors. 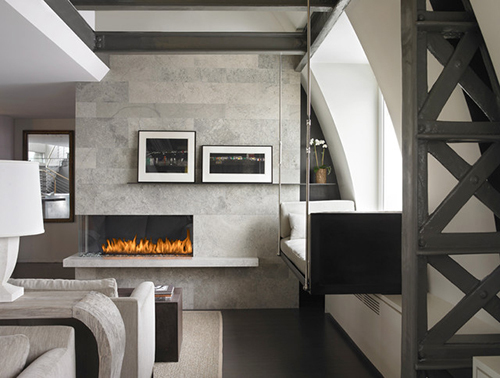 Just like in the kitchen or bath, a quartzite fireplace surround adds drama. Whether it’s in all white or richly textured caramel, quartzite can add a sense of cool modernity or natural warmth. Quartzite offers a very “finished,” often formal look, but it also conveys a sense of timeless luxury. Homeowners are recognizing the fact that the wide variety of colors, patterns, and finishes to choose from helps to create a striking fireplace design that adds personality to the overall design of the room. There was a time when the hearth was primarily made of brick. But this was also when it did most of the legwork when it came to cooking. Today’s fireplace is far more aesthetic than it is functional, and the materials it’s made of are as diverse as the owners of the home itself. 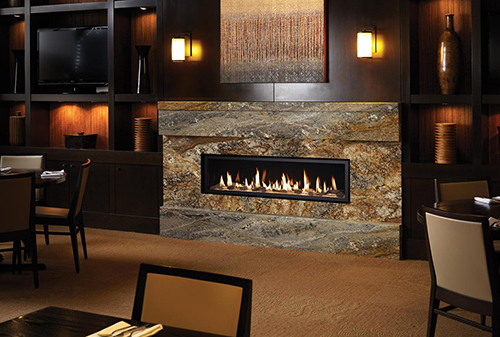 The natural stone you choose for a fireplace surround makes a strong design statement. And no matter what your style preference, there’s a material to help you reflect your unique personality.